John Rosenberg, Josh McIlvain, Annie Wilson. Photo by Erin Desmond. Thanks to all who came to the show! 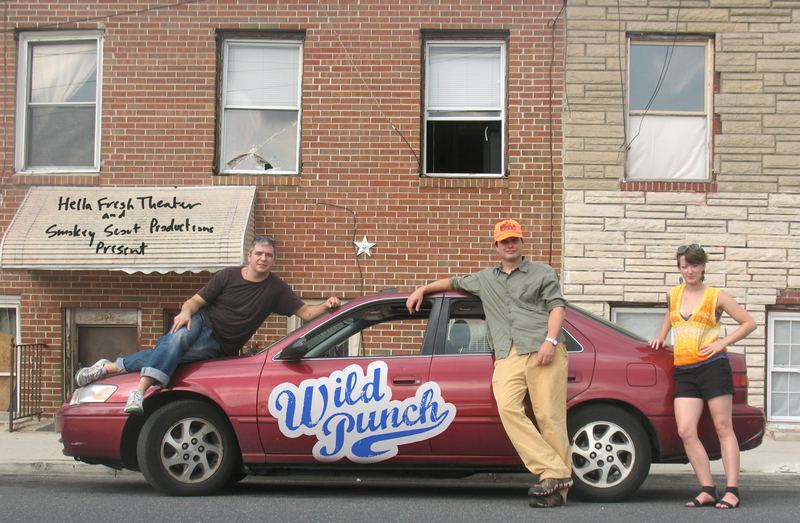 Wild Punch brings together three of Philly’s most independent voices in the performing arts at the Papermill Theater in Kensington: John Rosenberg of Hella Fresh Theater, Josh McIlvain of SmokeyScout Productions, and dancer-choreographer Annie Wilson. This collaborative production presents audiences with three new pieces distinct in theme, approach, and discipline within one show. Click on link to see the FULL WILD PUNCH PRESS RELEASE. Wild Punch features: dancer-choreographer Annie Wilson’s dance graceful frsutrated expletive, a solo about her personal evolution as a dancer that involves a hilarious and touching first person narrative, dance, and an anything goes approach; Josh McIlvain’s play Waiting For The Boss (with James C. Tolbert & Josh McIlvain), a comedic drama about maintaining your sense of worth as you grow older in menial, underpaid labor, and the intimate personal revelations between coworkers who care nothing for each other; and John Rosenberg’s play Automated Fault Isolation (Anna Flynn-Meketon & John Rosenberg), a dark romance set in 1950s Arkansas about a white high school girl and a soldier waiting to murder a black teenager she has lured to a motel room. From a play on risers in the round to experiencing a dance on the stage floor to inviting audiences into a motel room, Wild Punch creates changing performance spaces within the Papermill Theater. Between each piece, the audience then enters through a new door and into a previously unseen area, and a new performance. Wild Punch was presented at the Papermill Theater, a part of the Papermill Arts Collective, a five-story warehouse featuring artist workspace, an art gallery, and a 50-seat theater. The Papermill is dedicated to providing a low-cost space for artists to work and display their efforts. Hella Fresh Theater is the resident company of the Papermill Theater.